In the illustrious neighborhood of Coto de Caza, the owners of a dated home wanted a renovation that would make their abode as effortlessly stylish as the locale. After researching the competition, they decided that APlus was the only team of contractors with the skills to execute it perfectly. Originally, the home’s design was very standard. There wasn’t much in the way of character, as most of the construction and materials were fairly basic. Our task was to change all of that by incorporating personalized style and functionality into every part of the renovated rooms. The first step of building what the owners praise as their new “mastercraft” U-shaped kitchen was to remove everything - even much of the left outer wall. 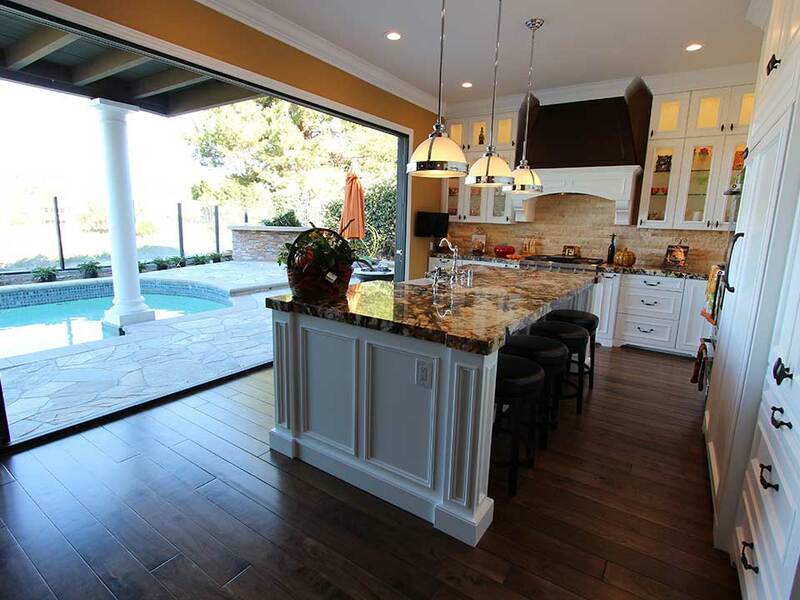 In the new open space, we installed a lengthy accordion glass door that opened up to the backyard pool deck. This created a refreshingly airy atmosphere by letting the natural light spill in, and also added the option of making the room an open-air kitchen. Another brightening factor was the installation of recessed lighting and sleek hanging lamps with dimmer adjusters, enabling the owners to control the intensity of their illumination. The ceiling’s light fixtures draw attention to the thick Beaded Colonial crown moulding that tops the custom cabinets, which were built in a Euro-style construction out of maple wood, with Victorian doors, Glenmore Dark Bronze hardware and a Straight White finish. 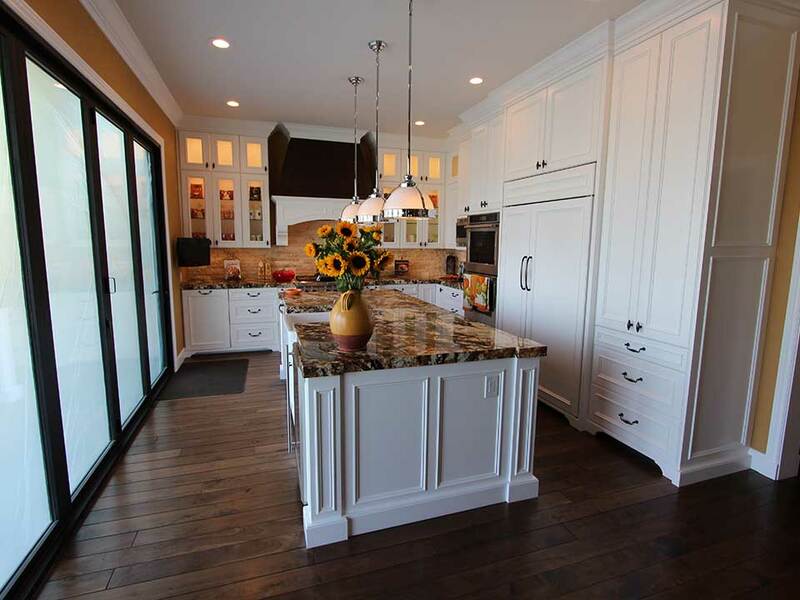 Many of the upper cabinets have built-in interior lighting, glass-panel door inserts and glass shelving. 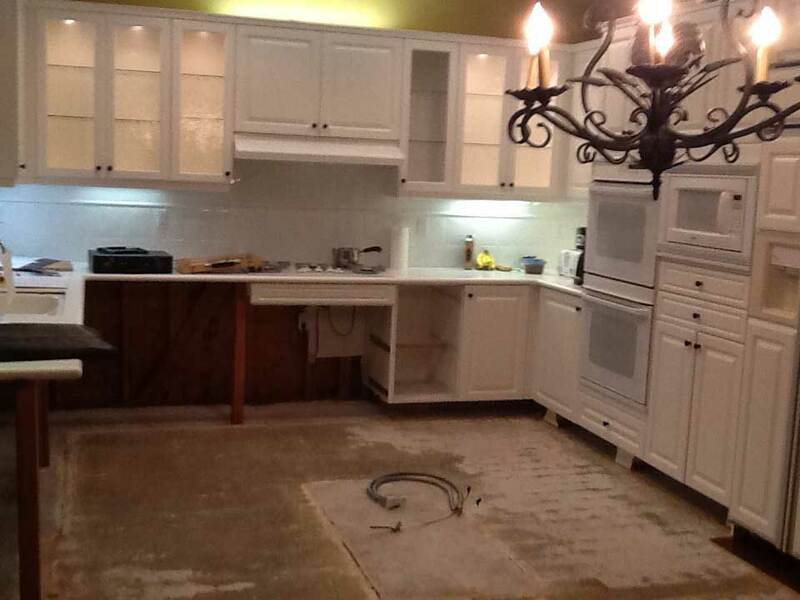 We also added lighting to the undersides of the upper cabinets, for extra visibility and a touch of cozy ambiance. 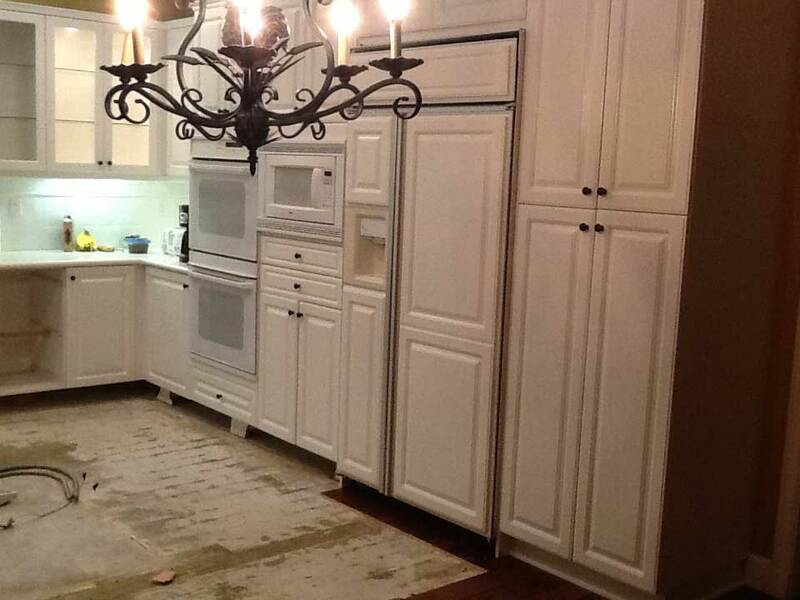 The refrigerator was housed within the cabinetry for a more cohesive look. Storage perks include lazy-susans built into the corner shelves (which have folding doors), and vertical spice pulls. At the center of the kitchen, we built an island with the same stately moulding patterns found on the rest of the new construction. 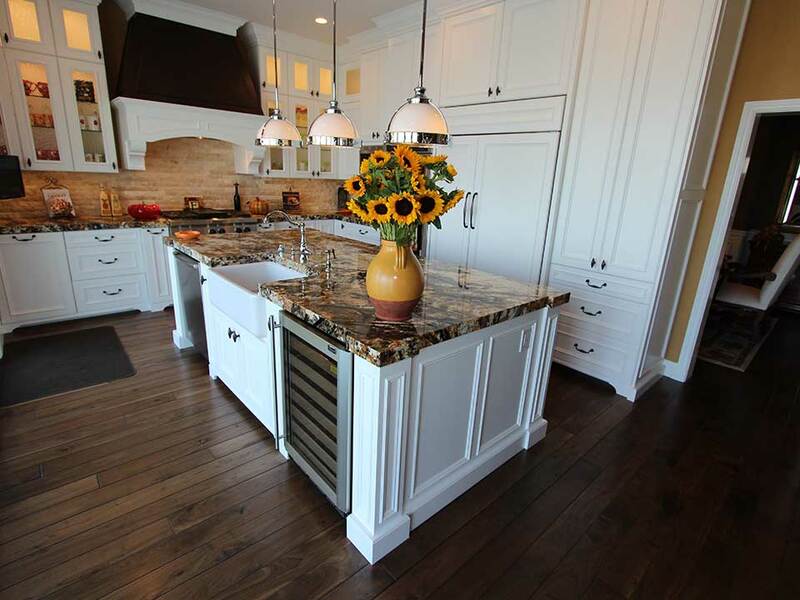 All of the surfaces were topped with thick slabs of granite featuring mottled earth tones. Upon the back and right wall of the kitchen, we put in a natural stone tile backsplash to add to the warmth and complement both the countertops and the subtly rustic hardwood flooring. 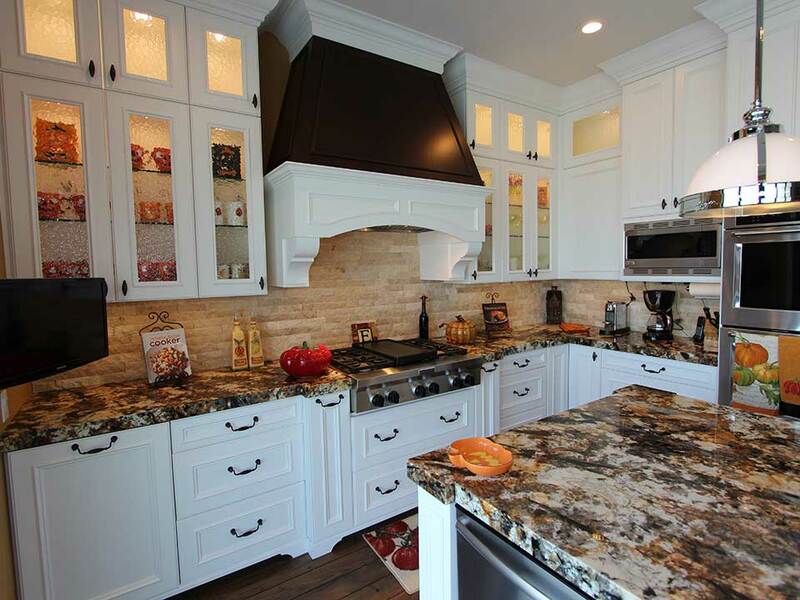 The star of the kitchen is the custom hood, which we designed and built ourselves. 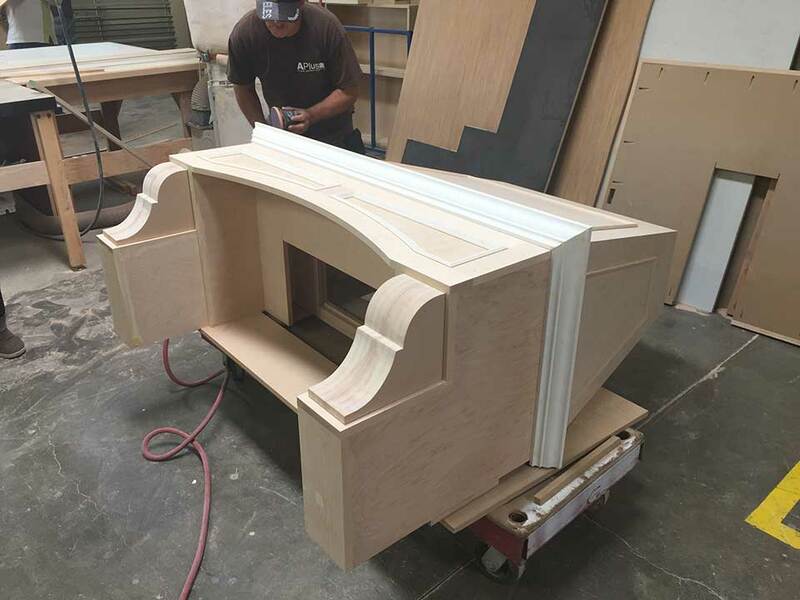 The process entailed carving the hood from raw wood materials, then sanding it smooth so that it could be coated with the white finish on the upper and lower sections, and a contrasting Manganese finish at the center. It features its own elegant moulding, as well as graceful corbels and interior lighting. The client chose all stainless steel appliances to add a modern touch to the otherwise fully traditional kitchen. There’s an Imperial Ventilator Insert within the custom hood, which rests above a KitchenAid Commercial Style Gas Cooktop. The KitchenAid Architect Series II Built-In Double Ovens, GE Monogram 1.1 Cu. Ft. Microwave Oven, and Sub-Zero 48” Built-In Side-by-Side Refrigerator with Internal Dispenser are clustered together on the kitchen’s right side. In the center island, a Rohl Shaws Original Single-Bowl Fireclay Apron Sink is set between a Bosch 24” Bar Handle Dishwasher and a GE Monogram Wine Reserve. 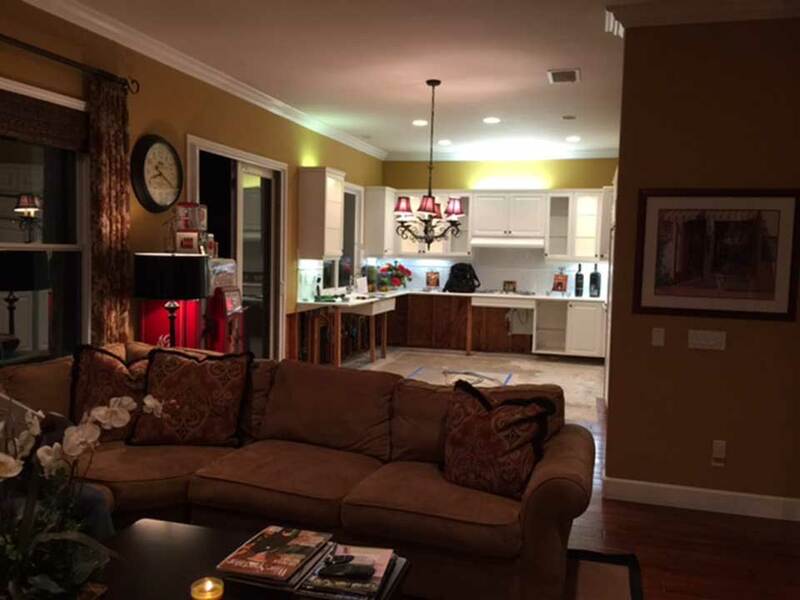 The crown moulding of the kitchen was extended into and throughout the living room, which was given a section of bright white wall paneling with a built-in compartment to mount the large flat-screen TV. 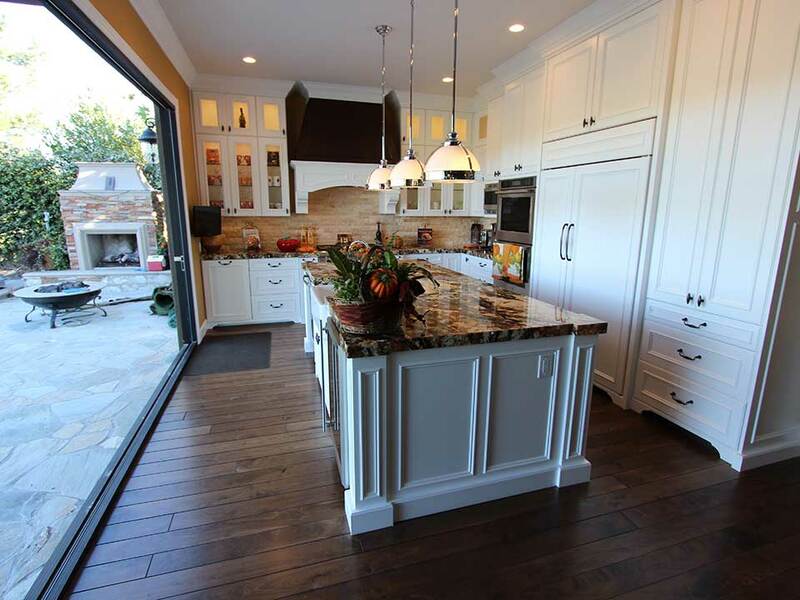 Have you considered upgrading your home’s value and style through renovation? 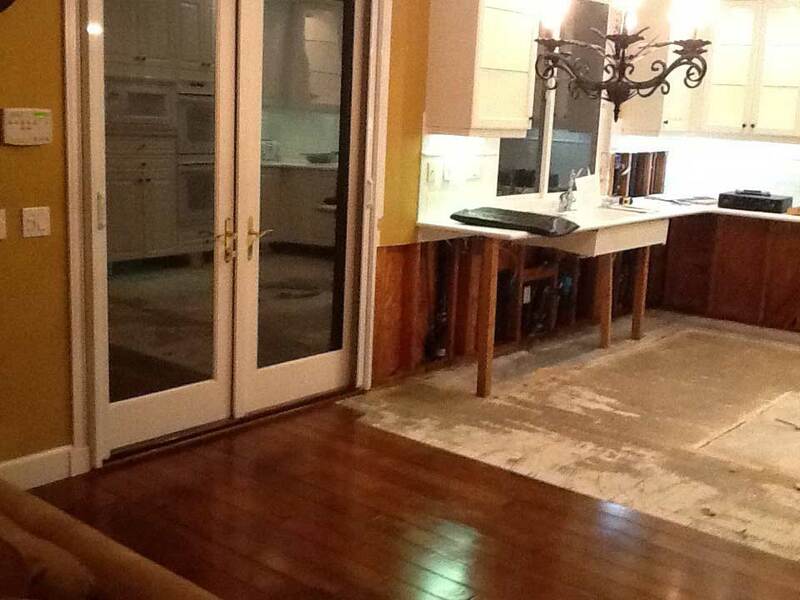 APlus contractors provides top of the line remodeling services in Coto de Caza and the rest of the Orange County area. Contact us today for a free quote!